Designed as the first part of a series of PDF releases, providing rules for those role-players who don't want to add magic and supernatural events to their contemporary-setting games. This product comprises chapters 1 through 3 of the complete work. 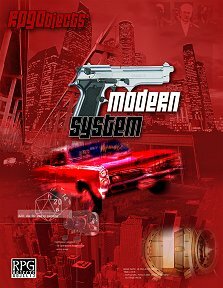 Publisher's blurb: "RPGObject's Modern System is a series of ebooks that provides a definitive source for all of our general, non-FX modern rules. It is essentially an alternate modern core rulebook and serves as RPGObjects' Modern System Reference Document. Characters is the first book in the series and encompasses basic Characters mechanics, Skills, Feats. "